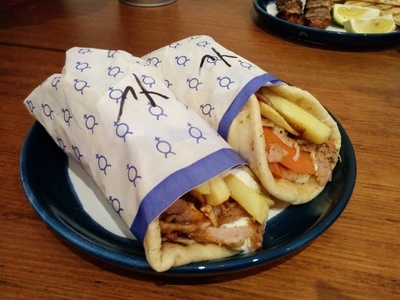 The Hellenic is one of the latest in a spate of Greek street food businesses opening up around Sydney. I tried it less than a week after it opened, in late December and then again the following week. I loved it the first time, but my expectations weren't quite met the second time around. I haven't yet been back for a third visit. 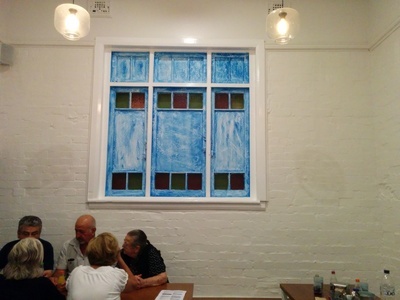 A lovely village window in stained glass and painted wood pops against the white walls. The place is decorated mainly in blue and white, but not entirely as you would expect. The wooden tables work well with the décor style and fit into the casual, relaxed vibe of most Bay Street restaurants and cafés. The decorating is surprisingly eclectic and modern, with different textures and features. A large spit, heavy with glistening, roasting meat sits next to the main window, tantalising passers-by and filling the shop with the smell of roasting meat. Unfortunately this means it also gets a bit warm inside. This spit is placed strategically - right in the window. The shop does eat-in and take-away Greek street food, but with a more extensive menu than other places and vegetarian options as well. There are dishes to share, like tiropites (cheese pies, $8.00 ), marinated octopus ($12.00) and fries with fetta and oregano on offer. 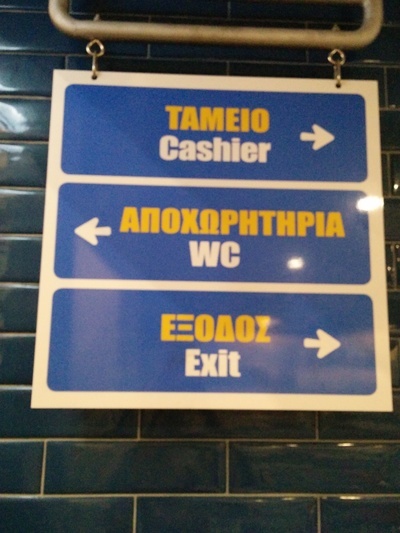 Just in case you get lost, this sign will help, whether you speak Greek or English. Pita yiro are available, with your choice of succulent chunks of either pork or lamb, as well as haloumi and souvlaki fillings, just to name a few. The pita ($7.90) is very traditional - shredded morsels of spiced meat, Spanish onion, tomato and chips, as well as a generous dollop of tzatziki all wrapped in thick pita. The tzatziki at The Hellenic is beautifully creamy and has a really good kick of garlic through it. These pitas are be beautiful. The Hellenic pita with pork. Plates of slow-cooked, spit-roasted meats come in two quantities: 250g ($16.00) and 450g ($25.00) and while this may seem strange, it is traditionally the way most restaurants work in Greece. The smaller quantity is a serve for 1-2 people and comes with wedges of pita bread and a dollop of tzatziki. The lamb is well seasoned - too well in some places actually, but all in all, tastes amazing. My only gripe is that the meat is very inconsistent. While some pieces were a bit dry, the others, that were cooked well, were soft and just melted in your mouth - these succulent chunks you just wanted to savour forever. 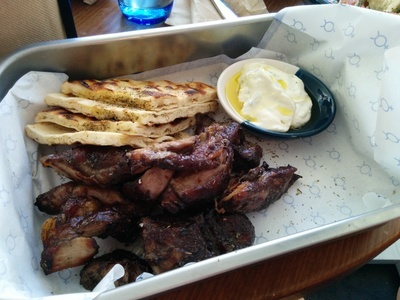 The smaller serving of slow-roasted lamb, accompanied by dip and pita. The Hellenic salad ($11.00) is lovely, as expected. Tomatoes, capsicum, Spanish onion, olives and soft fetta are sprinkled with a touch of oregano and beautifully complemented by the oil and white vinegar dressing, with a little extra pooled at the bottom of the bowl for dipping. The chips ($6.50) are thick cut, crunchy on the outside and fluffy on the inside. They are sprinkled with fetta and oregano, which adds an interesting dimension to this otherwise very typical dish. 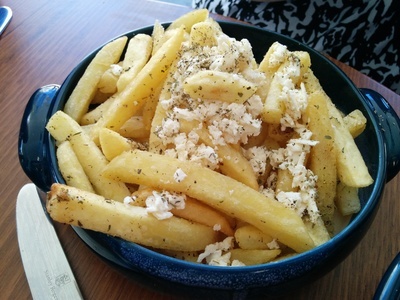 Piping hot chips with fetta and oregano. There is seating at The Hellenic, both inside the shop and outside, however on a hot day you're better off escaping the heat of the spit inside the store and sitting outside in the hopes that a cool ocean breeze will waft down Bay Street. This is an 'order at the counter' kind of place, so menus are at the register. The service is fantastic though and the food and drinks arrive quickly. The staff are friendly and obliging, and also very happy to make recommendations on the food. The food is typical modern Greek street food and very close to the real thing! 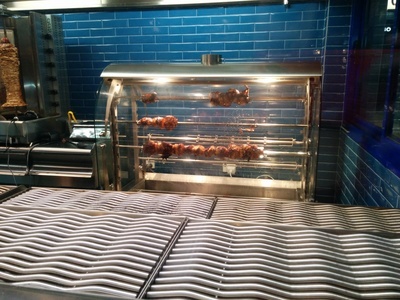 Overall, I think this has the potential to become one of the better Greek street food shops in Sydney. While they are still ironing out all the kinks, and finding their feet, The Hellenic is definitely worth a visit. Where: 346 Bay Street, Brighton-Le-Sands, 2216. Cost: $10 - $20 per person.